I have posted a preliminary Kenilworth Chess Club Calendar for 2012 and linked to it on my sidebar. New KCC President Ian Mangion will add events and modify it over the coming weeks. I have uploaded my 215-game PGN Archive for 2011 and a 1318-game ChessBase archive covering June 1, 2006-December 30, 2011. Links to games from the STC Bunch's Winter Blues 2011 and May Mania 2011 games have been added to my sidebar, as well. A running PGN file for 2012 will be attempted. Over the past four months, I neglected to post 12 games from several events and link to 8 Garden State League games from rounds 1-3. In a 100-mover, my inspired doubled pawn sac in a drawish-looking opposite Bishops ending gave Summit a tie with Newark-McDonalds! In Summit's win over Staten Island, I got away with a bad opening and defeated Ed Selling. 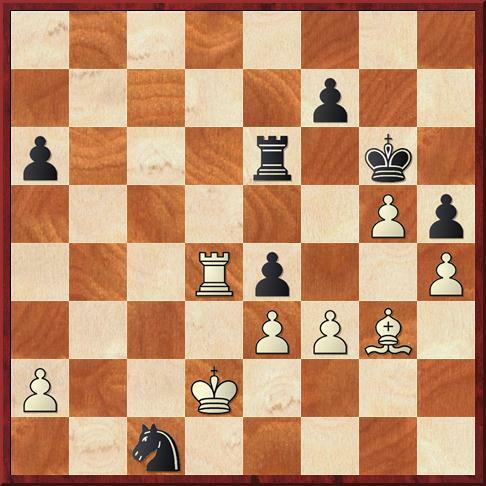 I opened with 1.f4 and got an edge against the Karpovs' Max Sherer but then quickly fell apart. 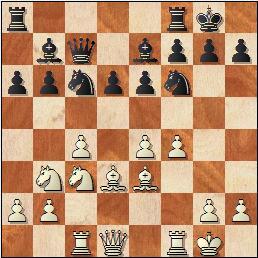 Black won Kenilworth Consultation Game #7, which began December 1st and finished last night. Updated, fully annotated Java-Replay and PGN. 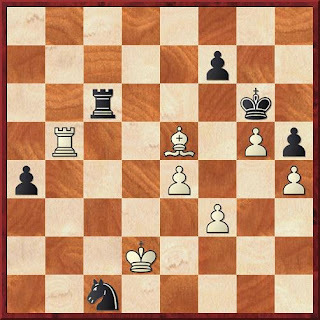 The 2011 Kenilworth Consultation Game will be resumed tonight, when White's sealed move will be revealed at 8:15 or 8:30 p.m.
Time Control: G/85+5 second delay. Analog clocks must be set to G/85, per new USCF rules. 19 players took part in the 20th Championship, which was won by NM Ken Chieu. The Kenilworth Championships for the years 2005-2011 were erroneously numbered as championships 15-21, instead of the correct 14-20. The 2012 event will be the 21st Club Championship. Sorry it took us 6.5 years to discover the error. A win by Jiří Ryška on board 21 has given the Czech Republic a 20-18 lead over the United States and reduced their its magic number to 5.5. A check of post #744 reveals that Greg Tomkovich's present term as KCC Trustee is not expiring. Therefore, his new term will run 2013-2015 and there will be no trustee election in 2012. Lou Sturniolo will begin his 3-year term (2012-14, deferred from last year) in January. Pat Mazzillo's term will run through Dec. 2013. - The business meeting was delayed for 30 minutes, until at least half of the membership (required by rule) was present. The meeting commenced at 8:45 p.m.
- Members in attendance included Joe Renna, Geoff McAuliffe, Greg Tomkovich, Pat Mazzillo, Lou Sturniolo, Mark Kernighan, Jack McCorkell, Ted Mann, Joe Azzarello, Bert Shiffman, Kevin Chen, Ziggy Bliznikas, Bob Sherry and John Moldovan. - Greg Tomkovich was re-elected (by acclamation) to another term as Trustee. - USATE sponsorship in the amount of one full entry fee ($145?) was approved. Funds will be divided between teams that contain 4 KCC members and use KCC (or Kenilworth) in the team name. - The 2012 Club Championship will be USCF-rated but will otherwise use the same 5-SS format as 2010. Prizes (trophies and/or cash) will be determined by a vote of those playing, prior to the event. The swiss format and alternating years of unrated, rated will be reviewed at next year's Business Meeting. - Preliminary plans for the KCC's 40th Anniversary were announced! There will be a tournament (in the spring), a party in late May, and, hopefully, a picnic (probably mid or late September). - Treasurer Geoff McAuliffe announced the club had a $49 profit in 2011. - A donation to the Kenilworth Recreation Department was approved. - A written change to the Club Constitution, with Trustees replacing Members At Large in the organization structure, will be drafted by Greg Tomkovich and put to a members' vote at the January 12th meeting. FM Charles Hertan won today's unrated blitz tournament at the Westfield Chess Club. Expert Mauricio Camejo finished 2nd. Alexander Ilnytsky was first among U2000s and Anatoly Shpirt took U1700 honors. Anthony Norris (2nd U2000) and Ishan Mazumdar (2nd U1700) also collected prizes. Since Labate withdrew before playing half of his scheduled games, his results were excluded from the standings. With 2 more draws since Dec. 2nd, the Czech Republic, which now leads the United States 19-18, has reduced its magic number to 6.5. The KCC's Business Meeting scheduled for Dec. 29th will now be held on Dec. 22, along with our Holiday Party. Part 2 of the Kenilworth Consultation has been postponed until December 29th because the analysis room was unavailable this evening. 42 players participated in the Westfield Chess Club's G/45 Quads today. The event could not be rated tonight because a membership exclusion request is pending. Please check the WCC's tournament history page tomorrow. Update 12/5 @ 1:57 p.m. - The event has been rated. Thanks to Todd Lunna and the USCF's Susan Houston for their help. The 2011 Kenilworth Consultation Game was adjourned last night following White's sealed move on turn 18. Play will resume next Thursday (12/8) at 8:30 p.m.
LM Mark Kernighan (2233) and Ian Mangion (1986) are among those taking part. 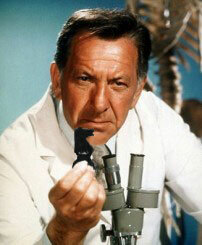 I am acting as Black's moderator. For full rosters and notes, go to the event's Java-Replay page or download its PGN. Italy has upped its lead over the United States to 41.5-27.5 and clinched victory in their ICCF correspondence match. In bouts yet to be decided, the U.S. trails the Czech Republic 18-17 and Germany 40-18. The report for today's Westfield Quads has been validated by the USCF but, due to unforeseen circumstances, it could not be submitted for rating this evening. Update 11/28 @ 7:00 p.m. - The event has been rated. Thanks to Pat Mazzillo for his help. By drawing both games on board 1, the Czech Republic, which now leads the United States 18-17, has reduced its magic number to 7.5. Tonight at the Kenilworth Chess Club, LM Scott Massey will be lecturing on Alexander Alekhine, who was World Champion 1927-35 and 1937-46. The event begins at 8:15 p.m. Admission is $5. SM Yaacov Norowitz won today's Westfield Grand Prix with a perfect 4-0 score. FM Arthur Shen, NM Greg Nolan and Anthony Norris (top U2150) tied for 2nd. Sam Chatsky earned the U1850 prize. The Westfield Chess Club is running a 4-round, G/30 Grand Prix tomorrow afternoon. Registration begins 1:30 p.m.
Nov. 13 Westfield Swiss #70 GPP: 10 Enhanced New Jersey 4 SS, Game/30. Westfield Y, 220 Clark St., Westfield, NJ 07090. $500 Guaranteed, $150, $125, $75, under 2150, under 1850 $75 each. EF: $35, $25 members. Reg. : 1:30-2:15 p.m. Rds. : 2:30-3:45-5:00-6:30 p.m.
NM Mark Kernighan and Praveen Balakrishnan tied for 1st at the 4th Sy Fish Memorial, which wrapped-up in Kenilworth last night. Ian Mangion was clear 3rd. Kevin Chen was the U2050 winner. Lou Sturniolo and Samritha Palakollu received U1750 honors while Aleksey Senyatkin and Chris Constantino tied among U1525s. The KCC's next rated event is scheduled for early January. My opponent could have tried 42.f4!? 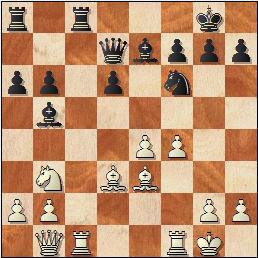 gxf4+ 43.exf4+ Kd4 44.g5 fxg5 45.fxg5 Kxc4 46.g6 Kxd5 47.g7 Be6 48.Bh7 and, after 48...Kc4, held via 49.Kf4! Kb4 50.Kg5 c4! 51.Kf6 Bd5 52.Ke7 Kxa4 53.Kxd6 Bf7 54.Be4 c3 55.Bd5 Bxd5 56.Kxd5 c2 57.g8Q, etc. Dr. K.E.D.G. Edwards' 2nd win on board 23 has brought the U.S. to within 1 point of the Czech Republic, which now leads 16-15. Post revised 11/5 @ 9:33 a.m. I am taking a half-point bye and do not expect to be at the Kenilworth club next week. The West Orange Chess Club is running a 6-round Grand Prix tournament, from November 8th to December 20th. Nov. 8, 15, 22, 29, Dec. 13, 20 West Orange CC Late Fall Swiss GPP: 6 New Jersey 6 rds., G/100, Reg. 7-7:30 P.M., rds. start at 8:00. EF: $30.00, members $25. Prizes: 1st $150, 2nd $100, 3rd $75 guaranteed; Best under 1900, $60, 1700, $50, 1500, $35 guaranteed. Details: http://westorangechessclub.blogspot.com/ and buickchess@gmail.com. Byes: Two 1/2 pt. byes available in any rd; must know by the end of rd. 4. Address: Toby Katz Community Center, 650 Pleasant Valley Way, West Orange, NJ 07052. Chess Magnet School JGP. The West Orange Chess Club will be closed tonight, due to the effects of Saturday's snowstorm. Therefore, the Karpovs-West Orange and Hamilton-Essex County College matches have been postponed. Team captains should contact each other and Garden State League President John Hagerty about re-scheduling. Matches at Kenilworth, Rahway and Branchburg are still scheduled for Thursday. Round 4 of the Fish Memorial brought 3 more upsets, including my 1st rated-loss to an U1700 U1685 since November 10, 1990. As in my recent defeats to Jo. Cohen and A. Chen, I was winning out of the opening. 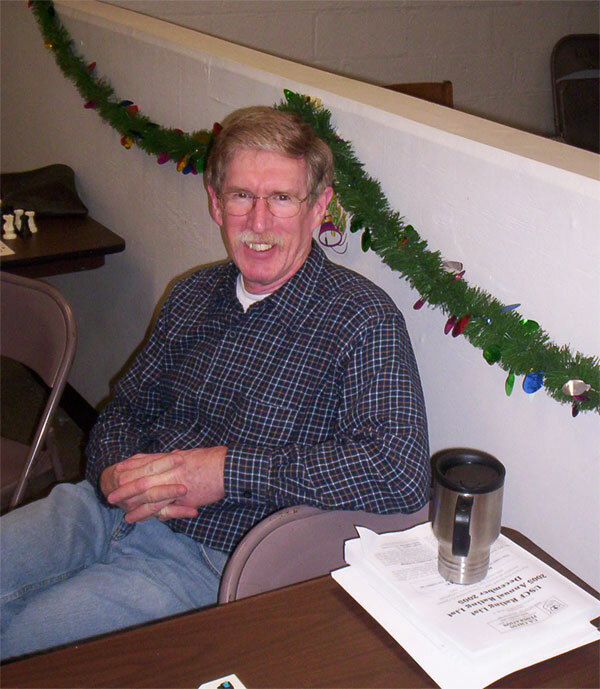 Todd Lunna won the Westfield Chess Club Championship last night with a score of 3.5/4. Richard Blank, Mauricio Camejo and Andy Chen finished a half-point behind. Highlight: Winning an Exchange in the opening. 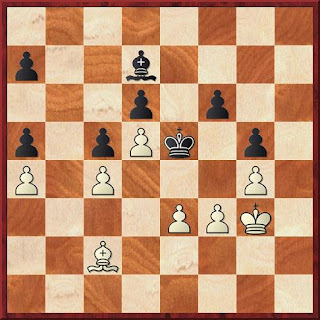 Lowlights: Missing wins at moves 15, 19, 27, 28. PGN of both games, with light notes. The upsets continued at the Sy Fish Memorial this week with Aleksey Senyatkin and Chris Constantino winning against Dan Komunicky and Pat Mazzillo while I drew top seed Mark Kernighan. Praveen Balakrishnan defeated Lou Sturniolo to take a full point lead going into the penultimate round. Java-replay & PGN for round 3.